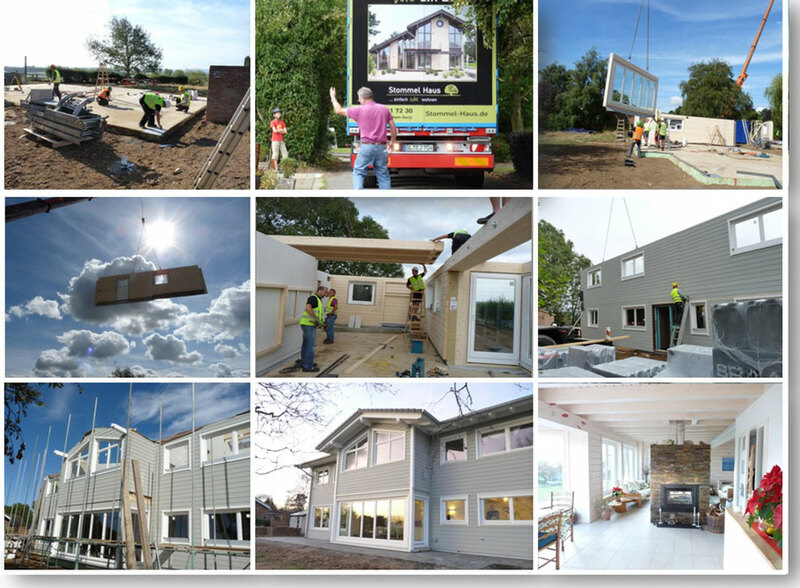 Wouldn’t it be wonderful to design and build your own bespoke home? What does it take to do that with Stommel Haus? 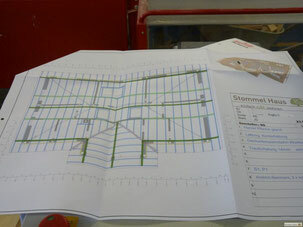 After the design of the house, the planning process, the slab build and slab check by Stommel Haus, the wheels of the Stommel Haus machinery will start. See here for more information about the design process. 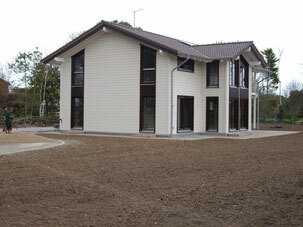 Our qualified engineers will translate the architectural design of your house into production plans. Each and every piece of timber, dove tail, beam, lintel as well as the windows, doors etc will appear in a detailed production drawings with lists of materials ready for the production team. A typical house needs about 350 to 400 plans. The CNC machine for the precision production of elements will be programmed and the team is ready to go. In the factory, teams of skilled carpenters and joiners supported by CNC machines produce the walls, ceiling panels and roof trusses. Bespoke triple glazing windows supplied by a Premium partner supplier are set into the walls. 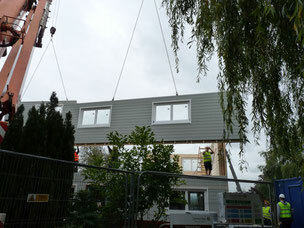 The elements of the house now need to be loaded onto the lorries in the right order. This needs meticulous planning. In the meantime on site a local scaffolding company hired by Stommel Haus will set up a scaffolding. The site toilet and skip will be delivered and the site will be prepared for the team to arrive. One of the benefits of manufacturing the house in the sheltered environment of a factory of course is that there is almost no waste on site. Waste genereated during the production process is almost entirely recycled. Shipment: The house is ready to go. 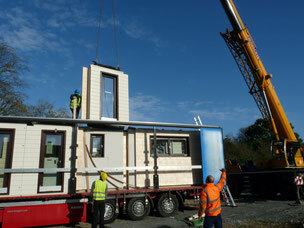 Our haulage partner brings the house to site by delivering one lorry after the other. Not all lorries arrive on site at the same time but get there just in time. Shell Assembly: The first lorry is unloaded by a mobile crane which is readily waiting on site. The exterior and interior walls of the ground floor are unloaded and immediately installed on the slab, one wall after another. When this first lorry has been emptied, it will drive off and make way for the next lorry . The next lorry carries ceiling panels to finish off the ground floor. The ceiling panels are let down by the crane into the precision prepared dove tails. No cutting of timber is required, everything slots together. Typically the ground floor is finished on the first day. On day two, the next lorry will deliver the walls of the top floor. 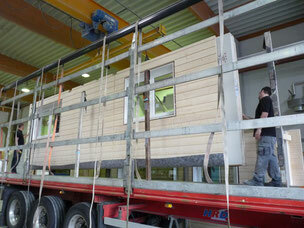 Again, exterior and interior walls are unloaded and assembled straight from the lorry onto the ground floor. On the second day typically the top floor is finished with the ridge, center and inferior purlin already set up. The crane can leave now. 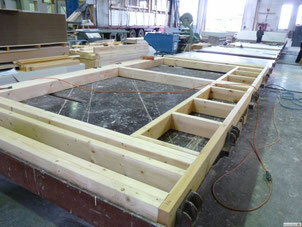 On day three, the assembly of the roof truss starts and typically takes a couple of days. On day four, the crane comes back to lift around 20 tons of roof tiles onto the roof where they will be installed by our teams. 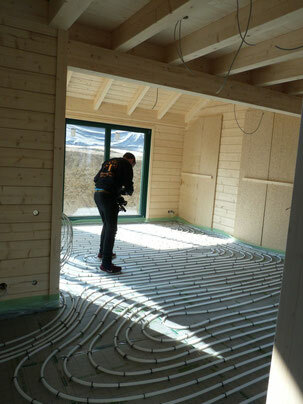 On day five, the finishing touches on the roof with roof drainage made of zink are done together with the insulation of the roof which is done by a specialised German team who blow ca. 4 tons of Isofloc into the roof cavity under pressure. This guarantees a warm roof. 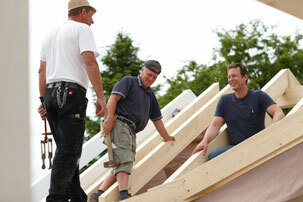 If the house has a flat roof, a special flat-roof-team from Germany arrives to insulate and properly seal the roof. The house is now wind- and water tight. It can be locked and you can already get a good feeling for the house. Some fine tuning such as window sills, sanding off any finger prints, and clearing the site will take a couple of days while the kitting out process starts. Finish and acceptance: This is the moment the Stommel Haus project manager comes in to do a detailed acceptance with you: Every single room, window and exterior door will be checked and together with you compared with the drawings and fitting meeting protocols. The acceptance protocol is signed by both parties. Kitting out: If you ordered the fully fitted house, the kitting out will start with the first fix electrics and heating/plumbing. Qualified master electricians, plumbers and heating engineers come from Germany with their materials to install electrics, under-floor heating pipes, fresh- and grey water pipes and the heating. allows us to install flush showers upstairs as well as downstairs. After the screed work a bit of patience is required as the screed has to dry for several weeks. We will not install flooring on a wet screed which could cause parquet to twist or tiles to come off. Stommel Haus will check humidity of the floors before work continues. Now the decorators come in to skim and smooth all the Fermacell surfaces of the partition walls and possibly exterior walls. After skimming and smoothing, a fleece paper will be installed ready for painting which is done by qualified German decorators. After the paint work, the second and final fix electrics and heating installation can be finished. 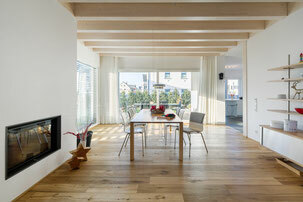 In parallel the flooring is installed which you selected during your fitting meeting in Germany. All bathrooms will be installed and finished. It would be great if your local kitchen fitters could come in now to install the kitchen in the kitchen area which has already be fitted with electrics and water in the right positions. Then the master joiners come in to install the high quality architraves and interior doors. The final trade is the installation of the made to measure stair case which was tailor made in Germany, brought to site and installed by master joiners. When all this is done, the Stommel Haus project manager comes in to do a final meticulous acceptance checking each and every bathroom item, socket and light outlet inside and out and prepare a written protocol which is signed by both parties. Have a look at some sample bathrooms, staircases and interiors and also view our online booklet with inspirations.